Two of the most storied programs in college football will battle it out on Saturday when Wisconsin and Alabama open their 2015 seasons in Arlington. 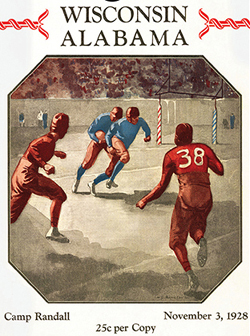 But despite the history surrounding both teams, the Badgers and Crimson Tide have only met once in the last century. So in honor of the second meeting between the teams, we decided to see what topics were trending in 1928. When it comes to remembering the Roaring 20s, people think about the jazz age, the booming economy and, of course, the era of prohibition. The movement was greatly sponsored by organizations such as Anti-Saloon League, Women's Christian Temperance Movement and members of the Progressive Party. The 18th Amendment to the United States Constitution officially went into effect in 1920, which made the sale, production and distribution of alcohol illegal. What came out of the amendment was the rise of bootlegging and speakeasys, which were hidden bars that sold alcohol beverages. The era was still going strong in 1928 and it wouldn't be for another five years that the 21st Amendment was passed, effectively ending the ban on alcohol. Former president Calvin Coolidge decided against running again in the 1928 Presidential Election, which made room for the two primary candidates to emerge: Herbert Hoover and Albert Smith. Republican nominee Hoover pledged continue the booming economy built under Coolidge. Meanwhile Democratic nominee Smith was a known anti-prohibitionist, which was a huge issue for his campaign considering the "dry" voters still had a majority. Hoover won the 1928 Presidental Debate in a landslide, winning 444 electoral votes compared to Smith's 87 votes. This would definitely have been a trending topic, and apparenty, the greatest invention since wrapped bread. Because it apparently didn't exist. Chillicothe Baking Co., located in Missouri, was the first company to sell sliced bread to the public. The company used an invention known as the Rohwedder Bread Slicer, which was created by an Iowa inventor Otto Rohwedder. Local newspaper The Constitution-Tribune ran an advertisement in its July 6, 1928 edition, which read "Announcing: The Greatest Forward Step in the Baking Industry Since Bread was Wrapped." And hence, the expression was born. Walt Disney premiered the short animated film "Steamboat Willie" at Universal's Colony Theatre in New York City. The film marked the "official" introduction of Mickey Mouse and his girlfriend Minnie. Although technically two Mickey Mouse cartoons had been produced, "Steamboat Willie" was the first actually distributed because Disney decided to incorporate synchorized sound technique after he was inspired by the 1927 film "The Jazz Singer." Disney thought the addition of sound would make the cartoon more appealing and it looks like his intuition was right. Time: "A Brief History of Mickey Mouse"